With cold water available at an instant, the sleek Churchill model with a U spout and rinse is convenient to your modern day filtered water requirements. This kitchen filter tap provides the household with hot, cold and filtered water through a dedicated waterway within a single spout, without cross-contamination. Replacing the filter is easy to change with our Katadyn filter cartridges. -- High grade, low lead, solid brass construction, plated to a thickness that exceeds industry standards, ensuring a deep protective coating, which is luxuriously pleasing to the eye and resistant to wear. -- Employing unique Triflow three lever layout operating system. -- Fluhs™ 1/4 turn precision ceramic valves. 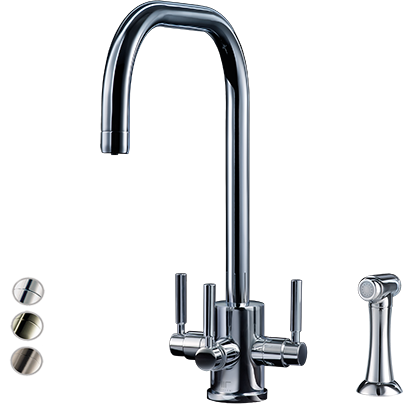 -- Dedicated waterway within a single spout for cold filtered water delivery, which avoids cross-contamination. -- High performance Swiss-made ceramic filter cartridge affords the benefit of cold filtered water, removing impurities down to 0.2 microns. -- Filter housing is manufactured from 304L stainless steel, offering superior hygiene properties. 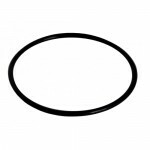 -- Bearing rings and ‘O’ seals are fitted on handles and spout to ensure maximum durability. -- Hand spray rinse designed with insulated handle. -- Filter cartridge is easy to change — no tools required to open the filter housing unit. -- Easy to install filtration system; fits comfortably under kitchen work top. -- Two year warranty on stainless steel filtration unit. --Five year warranty on brassware. * Free Delivery on any one single order placed online only to the value of £100 ex VAT or more. Applies to UK Mainland Deliveries only.